Accueil » Tournois » Tournoi de Fukuoka : Kyûshû baho » J12 – Takakeisho va-t-il tenir jusqu’à la fin ? Takakeisho va-t-il tenir jusqu’à la fin ? Une fois de plus, Takakeisho a vaincu son adversaire du jour, Tamawashi (Maegashira 2), et engrangé sa 11ème victoire. 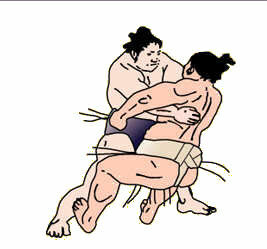 Avec une volonté forte de s’imposer, le komusubi n’a laissé aucune chance à son adversaire avec un tachi-ai très énergique qui a déséquilibré Tamawashi, avant de lui ouvrir la porte en direction des tribunes. 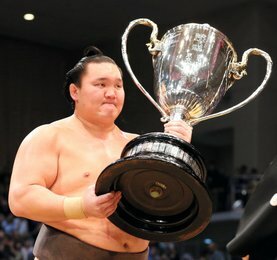 Juste derrière lui au classement, l’ôzeki Takayasu, plus haut gradé restant en course, talonne le komusubi avec une différence de seulement 1 victoire. 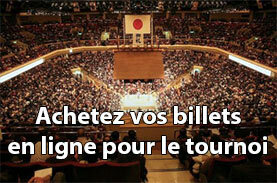 Une bonne résistance devant l’attaque en force de l’autre ôzeki, le géorgien Tochinoshin, suivie d’un petit tour de passe-passe en uwatenage, lui a permis d’en disposer. En début d’après-midi, Okinoumi, maegashira 11 a parfait son score à 9 victoires, en battant Meisei (M15), et l’empêchant ainsi d’atteindre le kachi-koshi (8 victoires synonyme d’avancement dans le classement suivant). Onosho (M13) rejoignait aussi Okinoumi à égalité à la 3ème place du classement avec un victoire probante contre Daieisho (M9). Ce dernier et maintenant distancé par les deux lutteurs en tête du classement, et un regroupement s’effectue à cette 3ème place, avec 4 lutteurs, Daieisho (M9), Okinoumi (M11), Aoiyama (M12) et donc Onosho (M13). Un lutteur n’atteindra pas sa 9ème victoire, c’est Goeido, le dernier ôzeki, qui a abandonné aujourd’hui, laissant le combat au bénéfice du sekiwake Mitakeumi, qui n’en demandait sûrement pas tant, lui qui atteint avec cette victoire son 6ème succès seulement. 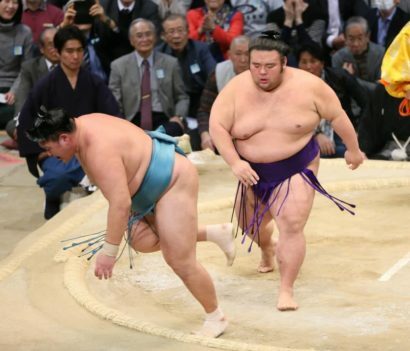 FUKUOKA – Takakeisho maintained his one-win lead after beating rank-and-filer Tamawashi on Thursday, the 12th day of the Kyushu Grand Sumo Tournament. 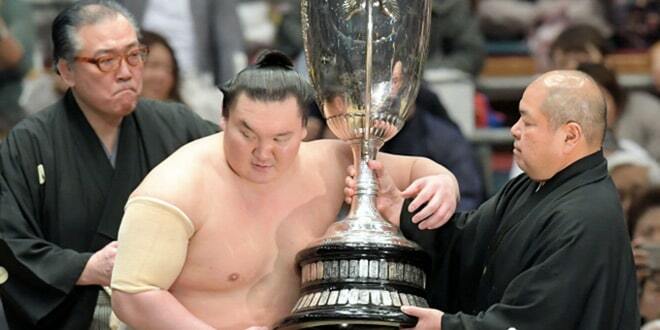 The 22-year-old komusubi, whose only loss came against sekiwake Mitakeumi on Day 7, beat the No. 2 maegashira comfortably and appeared primed to win his first top-division title with three days remaining at Fukuoka Kokusai Center. 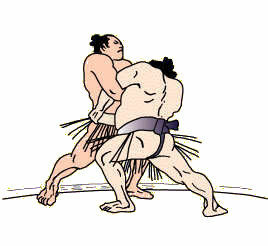 Takakeisho made little headway against Tamawashi (7-5) with several of the sharp shoves he is known for, but quickly slipped beside the Mongolian and thrust him out as Tamawashi lunged and stumbled out of the raised ring. 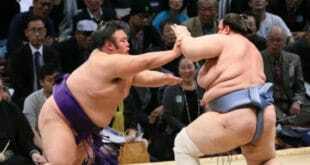 On Friday, Takakeisho faces No. 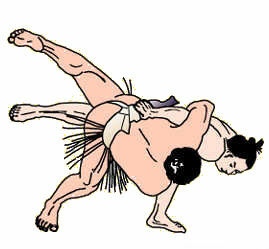 12 Aoiyama, whom he has beaten twice in as many bouts. 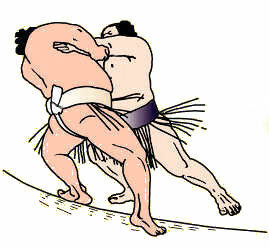 The final bout of Day 12 featured an ozeki showdown between Takayasu (10-2) and Tochinoshin (6-6), with the Ibaraki Prefecture native coming out on top and taking a two-win lead in their 18-match rivalry. After a shocking collision, both wrestlers locked up in their favored grips. 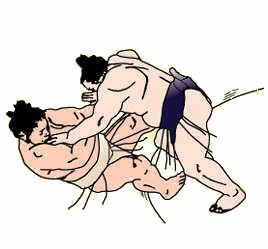 But Takayasu struck first to stay one win back of Takakeisho, pivoting and flinging the Georgian out by his belt. The two rank-and-file wrestlers who went into the day tied with Takayasu, No. 9 Daieisho and No. 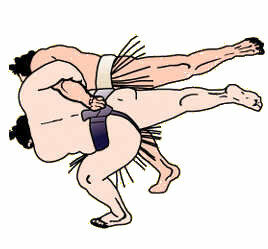 12 Aoiyama, each sustained a loss to fall to 9-3, two wins behind in a four-way tie for third place. Daieisho went all-out against No. 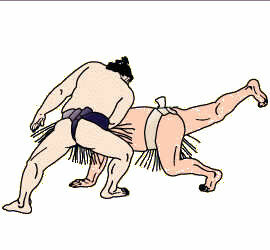 13 Onosho but was repelled and thrust down by his opponent, who joined the wrestlers in third place. Aoiyama remained grounded after a beltless arm throw attempt from No. 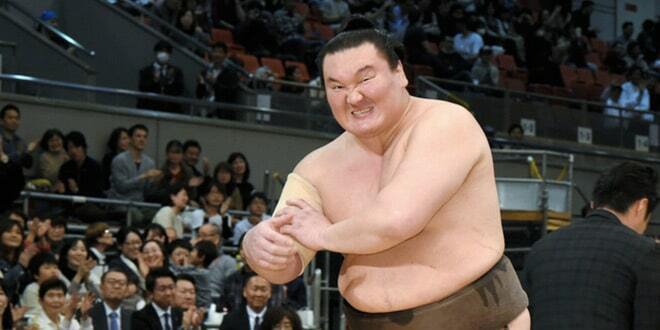 9 Kotoshogiku (7-5), but in front of his hometown crowd, the former ozeki changed course and drove out the 197-kg Bulgarian. Mitakeumi (6-6) got lucky and won his scheduled match against Goeido (8-4) by default, after the ozeki announced his withdrawal earlier in the day due to a right upper-arm injury. 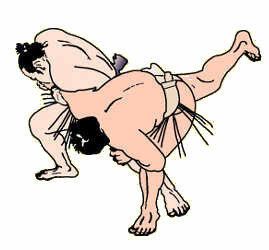 Goeido had won seven of their 11 matchups. 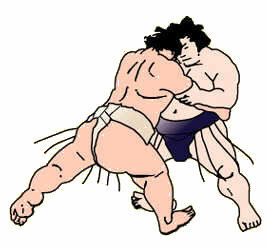 In other top level bouts, Mongolian sekiwake Ichinojo (4-8) bounced back from a loss on Wednesday with a win against No. 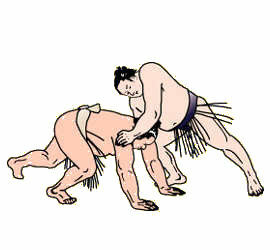 3 Ryuden (4-8), while komusubi Kaisei (3-7-2) was pushed out by No. 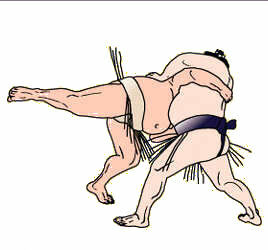 3 Nishikigi (6-6). Among other rank-and-filers, No. 11 Okinoumi (9-3) remains two wins shy of the lead after beating No. 15 Meisei (7-5). No. 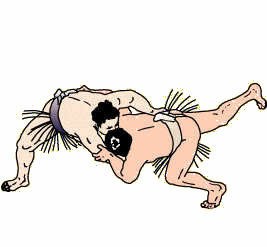 7 Shohozan (8-4) was the only wrestler to secure a winning record on Day 12, following a victory against No. 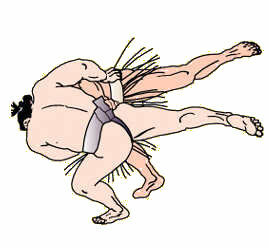 5 Chiyotairyu (5-7).